Photo: Road Transport and Bridges Minister Obaidul Quader talks to reporters after visiting the progress of the construction work of a flyover at Konabari on Friday, Jan 25, 2019. Gazipur, Jan 25 : Road Transport and Bridges Minister Obaidul Quader on Friday urged the registered political parties to join all the upcoming elections including the upazila-level one. The Minister came up with the call while talking to reporters after visiting the progress of the construction work of a flyover at Konabari in the city. “Once the Muslim League was a big political party and now their existence is facing extinction like endangered animals. Is BNP following the path of Muslim League? BNP has chosen the path of self-destruction and shrinking through boycotting the elections,” he said. 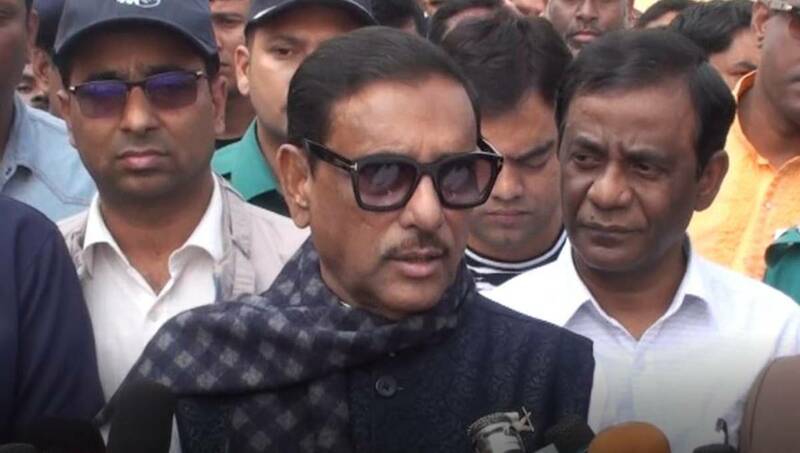 Quader also urged them to take part in the Upazila Parishad elections, Dhaka North City Corporation and Kishoreganj by-election. The Awami League general secretary also asked BNP to reconsider their decision about boycotting the elections. BNP has decided not to participate in the upcoming upazila election and the by-polls to the vacant mayoral post of Dhaka North City Corporation (DNCC). BNP secretary general Mirza Fakhrul Islam Alamgir disclosed the decision after a meeting of party standing committee members at BNP chairperson’s Gulshan office on Thursday night. “We’ve taken a decision that we’re not taking part in the upazila polls and the by-election to the mayoral post of Dhaka North City Corporation. We think elections under the current government and the Election Commission will only turn into a farce,” he said.